What a difference a day can make – or a week for that matter! 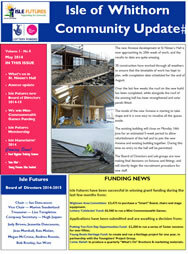 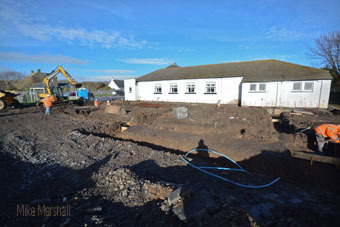 Following the sod-cutting ceremony for the new St Ninian’s Hall Annexe at the end of January, contractors 3b construction have lost no time in getting stuck in with the building …works. 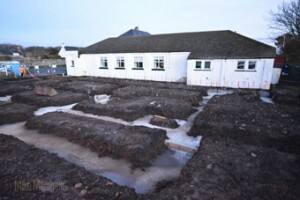 Excavations for the foundations, followed by a steel reinforcement matrix were quickly followed by a day during which a shuttle service of lorries from Glenluce delivered the concrete mix. A perfect day for the job, with bright sunshine, and a lull in the weather before an expected stormy Saturday. 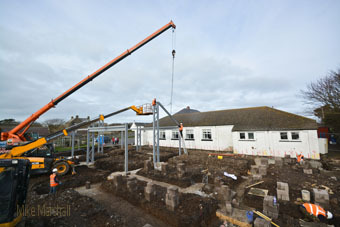 On Monday 10th, an 0730 start with the first delivery of steel beams and uprights needed for the main framework of the annexe. 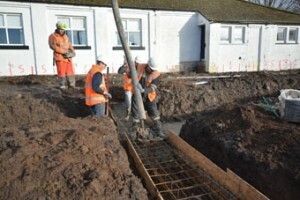 Shortly afterwards, a huge consignment of concrete blocks arrives to enable the start of work on the surrounding walls. 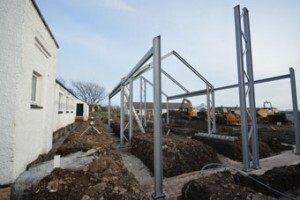 As soon as the structural steel had been placed on site, a giant crane moved in to begin the delicate task of lifting the sections into place. 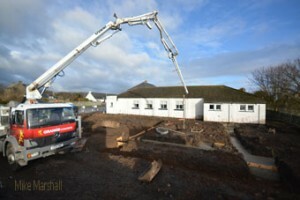 Fortunately, another calm, sunny day enabled the work of assembly to proceed quickly, and by 4pm passers-by and youngsters coming home from school could hardly believe the transformation that had taken place.